Things around the home that didn't bother us over the winter months, like piles of shoes and boots in the closet and the front door, start to get under our skin. So we spring into action. With hands on our hips, crookedly we stand in the foyer evaluating our winter clutter, thinking ... 'how did I stand this for so long' ! And before we know it, the itch to organize turns into a full blown rash and we're looking around the house trying to reshuffle pieces of furniture, repurpose dressers, and re-do closets. Freeing ourselves of the unnecessary, we start with the basics ... we bag'em and tag'em. We only mean to clean the house, but our soul gets spit and polished too. We don't plan for this to happen, in fact we never do. But year after year, without fail, we feel lighter. We've jammed our closets with extra sweaters, bulky coats, mitts, hats, boots, and too many pairs of shoes. It's not right. We know it's not right. Guilty. But, during the holiday season we really did have bigger fish to fry ... Like cozying up to a warm fire. Overflowing closets somehow made the fire feel better. It's winter ... we're not all there. There's a name for our condition: Cabin Feveritis. To clean our soul, we start with soles. The stinky invaders come first. Sorted shoes; who'da'thunk that all it took was 'sorted shoes'? All this time we thought life was complicated. Sole ... Soul? Well my gawd, life's greatest mystery has been solved. Moral of the story - clean your closets, organize your soles, and the future is yours! ... Not really, but at least your closets will look great while your soul floats. I really like that shoe storage bench! What a great idea. The spring cleaning bug has struck me too, Barbara. 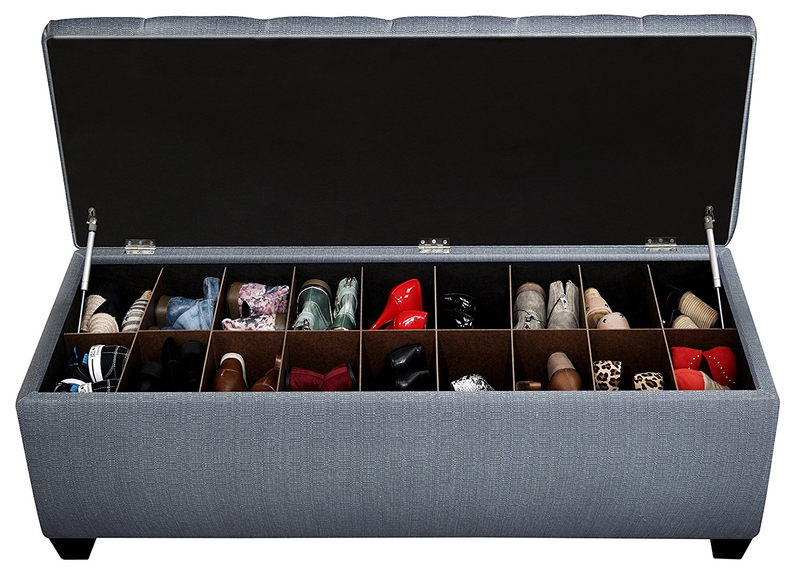 Great idea to combine a useful piece of furniture with a storage place for shoes. Nice. I absolutely agree with you, Barbara, and love how you connected "soles" with the soul. Why is it that we put up with clutter through the winter? There's just something about this early spring time of year that screams, "Clean me! Organize me!" and I'm thrilled to comply. And yes, I love the shoe bench, too! Cynthia lmao. If we had the answer to that we could bottle it and become gazillionaires! All wonderful ideas Barbara. You do have a way with words and I just love it. I like the shoe bench idea. We have a shoe rack but the shoes are always falling off. Thanks! !